Fabuloso looks good enough to drink | Can someone please explain...? Let’s do a little roleplaying. Pretend you’re a kid. Say, 5 or 6. And you’ve been playing, and you’re thirsty, and mommy has just come back from shopping, so you ask mommy if you can have some grape juice, and she says yes. So you go to the bag of groceries and find this bottle of Fabuloso. Looks like grape juice. Different brand than Welch’s, but mommy always buys different things depending on what’s on sale that week. You’re pretty sure you’ve heard the word on the label. You think it means really cool. So you twist open the top… it’s hard, like some caps are, but you get it. And you pour some into your favorite sippy cup. And you only spill a little on the counter and a little more on the floor. And then you drink it… and it burns going down, and you cough, and your tummy feels like it’s going to explode… and then you pass out, vomit, and choke to death on your own vomit, all before mommy finishes unloading the car. Pretty bottles all in a row. Delicioso? No, Fabuloso! Oops. Yes, my friends, that is a picture I took today of a supermarket shelf full of Fabuloso in all its glory. What beautiful packaging! What clever branding! What a great idea! Let’s make our multi-purpose cleaner look like a sports drink or juice and smell like one too. Cleaning is yucky, but everybody likes Gatorade. What the heck were they thinking? And by the way, if you don’t think anybody would actually mistake Fabuloso for a sports drink or juice, check out this article in The Roanoke Times from 2006 that cites research by a physicians group that documented 94 cases of accidental ingestion in the first 6 months of that year in Texas alone. According to the article, many of the cases were children under 6 years old. 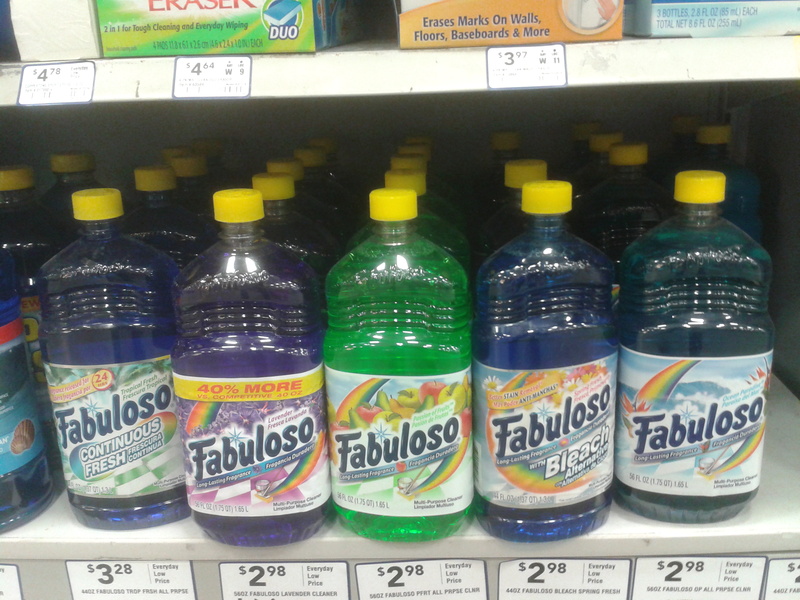 Somebody at Colgate Palmolive made the choice to color bottles of Fabuloso like sodas or juice drinks. Somebody made the choice to package them in plastic bottles that look just like a sports drink. Somebody made the choice to make them smell fruity. And somebody made the choice to name them Fabuloso, which sounds absolutely… delicious. So can someone please explain to me why didn’t someone else with half a brain and an ounce of common sense try and stop them? Colgate Palmolive should get rid of the team who worked on this product. You would think in this day and age people would have stopped putting profits above safety. Just make sure that those lawyer friends of yours include the U.S Consumer Product Safety Commission as co-defendants. Isn’t it their job to catch this stuff? A friend of mine who lives in Mexico, Lisa, commented about this post on Facebook that she thought it was the cheapest packaging they could come up with, and I wouldn’t be surprised if cost really was running the show here. I’ve seen some pictures of other, I think earlier packaging, that looked exactly like the smaller sports or water bottles. Taller and thinner. Thanks for the comment, Josef. Good job, Jeff, bringing this to peoples’ attention. The possibilities for tragedy are mind-numbing. Especially if you’ve been drinking Fabuloso. (The mind numbing, that is.) Thanks for the comment, AF. I am sorry but i use this to clean my house and my 4 yr old knows it is cleaning product not juice…..because i educate my children …..and what the hell would a 5 or 6 yr old child have a sippy cup for! If you child is 5 or 6 and can fix his/her own sippy cup … they are to damn big to have a sippy cup!…. Take the time to educate ur kids dont blame a product for causing problems in YOUR home. Charol, I agree that it is a parent’s job to educate their children. But as a parent, you also know that you can’t predict every misguided choice a young child may make. And you can’t control what they see in other people’s homes. And regardless of that, I can expect and demand that a cleaning product not be misleading. I can protest by not buying it, or lodging a complaint, or even blogging about it. As for the 5 or 6 year old using a sippy cup, that’s my invention, and comes from my not remembering at what age my daughter stopped using a sippy cup. But regardless of what age she stopped, or your children stopped, I have since noticed older children using them. In a world where some people still breastfeed their children at 6, or some parents still keep their older children in strollers for convenience long past the age where they can walk, can we at least agree that there is some variance in child development? So what is being done? This is serious and needs to be on the recall list for repackaging. Does anyone know how to go about this? Judy, the U.S Consumer Product Safety Commission has cleared the product, so on that level, nothing is being done. I guess you could always contact Consumer Reports or a watchdog group if you wanted to actually help get something done, as opposed to just blog about it like lazy old me. This does go right back to home education and responsible parenting. I worked for ten years in a major supermarket chain. I have stocked the soft drink, juice and cleaning aisles, and not once did I find a bottle of cleaning fluid of any kind in any of the juice or soft drinks aisle. My concern isn’t about parents buying the product in the supermarket, Jacurrent. It’s about what little kids do at home, when their parents aren’t looking. I wouldlike to educate you that some older children are still in strollers because they cannot walk. My Grandson has CP and falls more than he stands, for this reason he is sometimes piggybacking on his sisters stroller. In addittion, Wheelchairs for younger children look very much like strollers. Thanks for pointing that out, Tammy. When I said that there is some variance in child development, that’s one of the points I meant, but clearly, my choice of the word “convenience” is inappropriate in the case of true need, as you describe. This is a crazy post. Of course children make accidents of this sort. Hell, they even try to drink things that don’t necessarily look fruity as well. What 5 or 6 year should be allowed to pour their own juice in a sippy cup? None! Educate your kids people or they may just grow up and write a blog like this. One that shows how neglagent some parents can be. Let’s save our kids! They’re drinking bleach! Try as we may, they will eat and drink things and we may never catch them. Fabuloso is great! We all know that the appearance of he bottle is that f Mexico, bright, festive and wonderful! Stop ating! I am 53 and accidently ingested this stuff 50 miles offshore this past weekend. Thought it was a fruit drink and went to take an Advil and used this to wash it down. The bottle on the boat had no mention of bleach or cleaner on the front at all. Could not get access to information for 7 hours to determine what first aid to perform, so I just induced as much vomiting as I could (did not have milk). Got a nose bleed and diarheea for 3 days. The high end of my voice has not returned after 4 days (could be stress from vomiting, time will tell). Hate to see what happens if a child gets into this stuff. Sorry you went through that. If it happens to a 53 year old, how much more likely to happen to a kid! I was cleaning the kitchen floor and my mom grabbed the bottle of Fabuloso , she thought it was the cranberry juice I always buy. The bottle is the same shape , same color and has fruits all over the cover. So , yes It can happen to anyone. Educating kids is a good thing but be realistic if it looks like fruit juice they may drink it. Come on people you are too easy to manipulate, Don’t just believe what some random fearmonger writes on the internet. the product is not even that dangerous “the product is only a mild gastrointestinal irritant and is unlikely to cause any serious illness. One of the authors even tasted it, and found it “fruity with a pleasing aroma,” but with a bitter aftertaste”. But oh well I guess exaggerating stuff brings more page views. How do you open the Damn thing? Seriously! My mother has hypoglycemia, when she goes into a low blood sugar attack she drinks juice. However while she is low she has severe confusion. By mistake the fabulousa was on the cupboard, she swallowed about 6 ounces of fabulousa. She didn’t even know that she had drank it. I found her in a coma, and her organs were failing. She was rushed to the hospital, we unfortunately had know idea what had happened. After several hours of testing and antidotes we had to put her on dialysis For 5 hours.. she stayed 7 days in the hospital. after being released, the following day we had to return the er. Now she is battling pneumonia due to the tube from life support Causing infection. Her kidneys are elevated at 2.6 and still rising. A healthy kidney should be at .6 to 1. She is no where near recovering. So the fact is you can educate your children and pray for the rest because fact is my mother is highly educated and knows this is a cleaning product but every situation is different. There are hundreds of cases from toddlers to teens to the elderly. Why would you not just change the bottle the color and the label. It’s as simple as that. I forgot and used it at work and my lung start killing me and ended up with the chills like always.